This month, Magical Blogorail Red is discussing how we celebrate at Disney. For my family, Walt Disney World is where we celebrate most of life's major moments and these celebrations are among our favorite topics here on the blog. My parents celebrated their wedding with a Walt Disney World honeymoon in 1973. When I graduated from high school in 1994, my parents took me and three friends to WDW and we stayed at what is now Old Key West. DisneyDad and Mom had bought into Disney Vacation Club the previous year. My parents and brother came to visit me for Christmas during my college program semester in 1997. We had a tree and everything at Old Key West. In 1998, my parents celebrated their 25th anniversary with dinner at Cinderella's Royal Table. 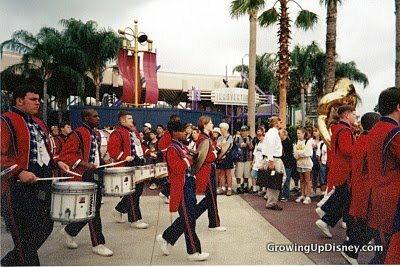 Chris marched in the Magical Musical Days with his high school band in 1999. In 2005, we celebrated my first marathon finish, my Disney Fairy Tale Wedding and Disney Wonder honeymoon. Dad and I had a special dinner at the Victoria and Albert's chef's table. All of the ladies who traveled to Florida for the wedding were invited to tea at the Grand. My besties and I enjoyed a bachelorette party of dancing at Manequins and laughs at the Adventurer's Club. The wedding party loved rehearsal dinner and fireworks at California Grill. In 2007, we celebrated my dad's recovery with a visit for the food and wine festival. We also introduced my inlaws to Ridgeway-style park touring on that trip. In 2008, I surprised my parents right before the start of Illuminations with the news that they would be grandparents. The photo is from Grand Floridian Cafe later in the trip. In 2010, we celebrated Tink's first birthday with a smash cake in a grand villa at Old Key West and then breakfast with Chef Mickey on the big day. I think it's fitting that she officially turned one while watching the 3 o'clock parade. 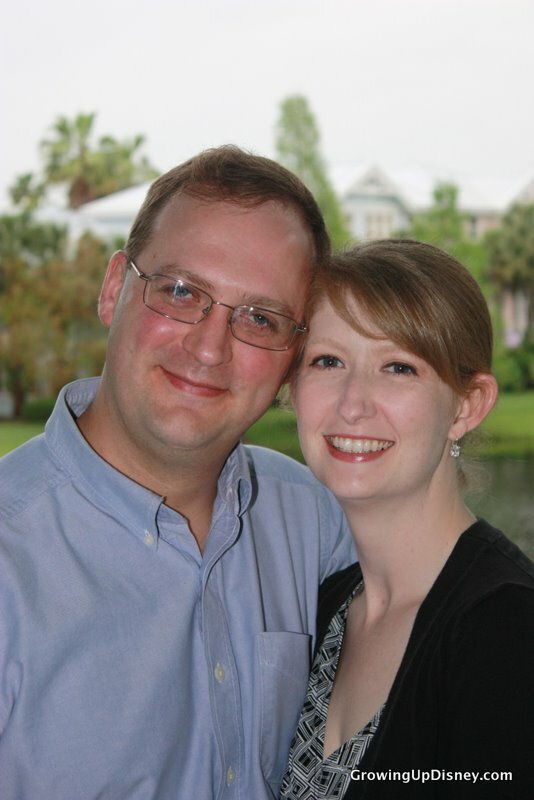 On that same trip, Andy and I celebrated five years of marriage with dinner at Jiko. On our next visit in 2010, my parents were again surprised with happy news when Tink wore a "big sister" t-shirt to dinner at Olivia's. 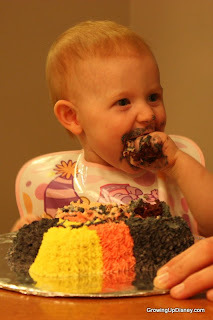 Tink's second birthday was shortly after we moved to North Carolina last year. 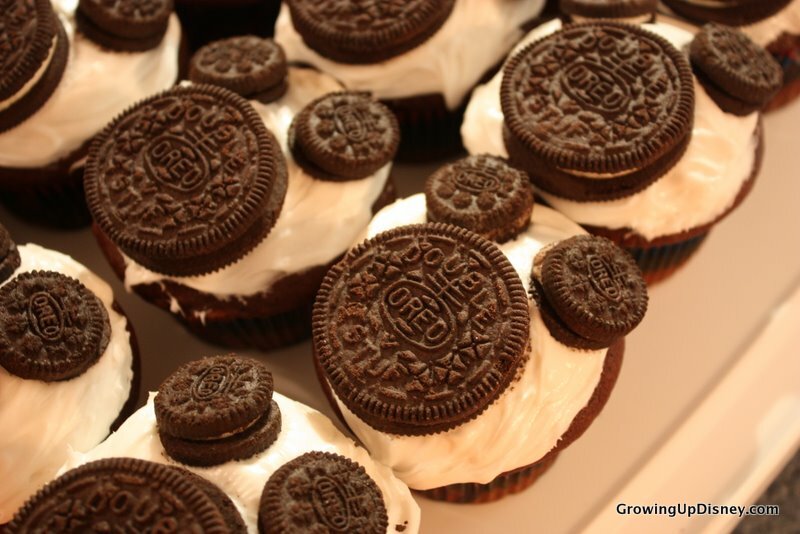 We stayed "home" and had Mickey cupcakes. 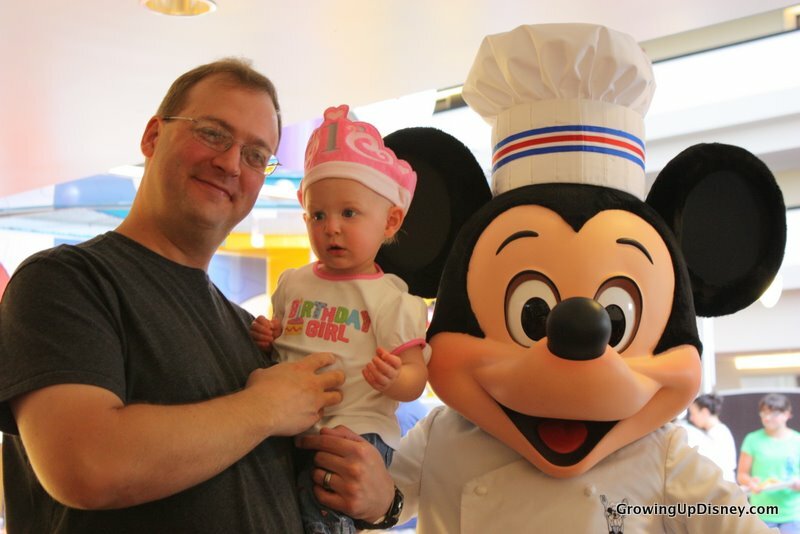 Baby Minnie will likely celebrate her first birthday in Alabama but the theme will be, what else, Minnie Mouse. I look forward to future celebrations with the Mouse. We'll be celebrating Baby Minnie's first WDW trip this fall. I'm hoping to get first haircuts for both of the girls on Main Street. 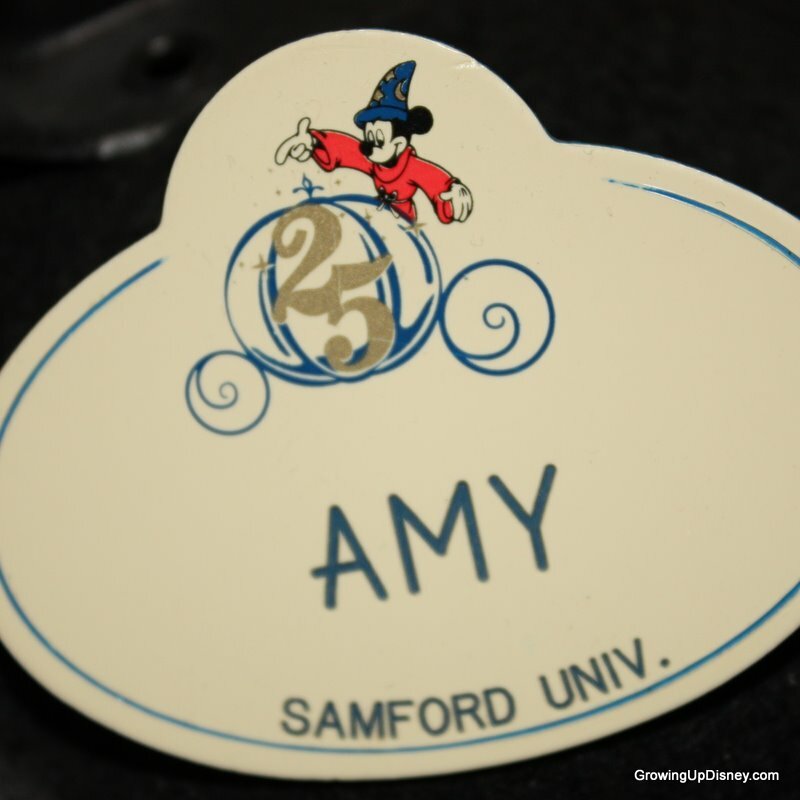 For birthdays, anniversaries, first visits, etc, we always make sure to get buttons from Guest Relations. Thank you of joining me in this walk down memory lane. The Growing Up Disney family loves to celebrate life's special moments, great and small, at Walt Disney World. Your next stop on the Magical Blogorail Loop is Disney Donna Kay. Amy is there anything that you haven't done at Walt Disney World? I am very jealous!! What wonderful memories!! Thanks dear! Walt Disney World is truly my second home. i loved this post so much. something about it brought a tear to my eye. 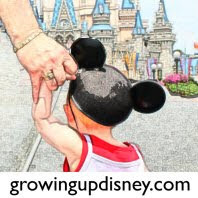 disney really has been there for all of us in so many ways...with our parents, our spouses and now our children. thanks for sharing this, amy. this post is a total keeper! Great post! I just love how Disney is such an important part of your family!! Amy, I absolutely love this post. It's so touching that you are able to pass this wonderful part of your life down through generations. My favorite photo is your parents celebrating their honeymoon... and it all comes full circle with your fairytale wedding. Thank you so much for sharing. I so want to do Victoria and Albert; and taking our vows again at Disney World would be very nice also. Your parent's photo in 1973 looks like one we took the same year on our honeymoon - if I could just find it. Great story. Brought a tear to my eye too! We've had some great memories at WDW. 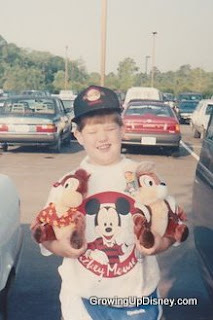 You forgot about taking you to the MK when you were about 4 and sitting watching the 3 o'clock parade, riding the train, and that picture of us with the wooden indian on main street!